On Friday, January 25, 2013—the eve of the enthronement of His Beatitude, Metropolitan Tikhon at Saint Nicholas Cathedral here—Orthodox Christians from across the country will gather in the US capital for the annual March for Life. The members of the Orthodox Church in America’s Holy Synod of Bishops will join Metropolitan Tikhon, students from Saint Tikhon’s Seminary, South Canaan, PA and Saint Vladimir’s Seminary, Crestwood, NY, and clergy and faithful from the region and beyond for the march. According to Archpriest John Kowalczyk, a pro-life activist and co-founder of the Orthodox presence at the annual March, this year’s event will be attended by the largest number of OCA hierarchs in history. 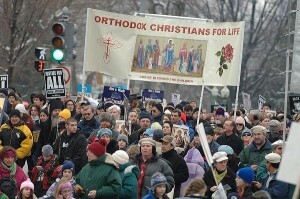 Marchers are asked to gather under the “Orthodox Christians for Life” banner at the Ellipse at noon. They will march to the Supreme Court, where Metropolitan Tikhon will lead the hierarchs, clergy and faithful in prayer for the victims of abortion. Father John added that on Thursday, January 24, Metropolitan Tikhon will preside at the celebration of Vespers at the OCA’s Saint Nicholas Cathedral, 3500 Massachusetts Ave. NW, at 6:00 p.m. A reception will follow. All marchers are invited to attend. On Friday evening, the annual Rose Banquet will be held at DC’s Hyatt Regency Hotel. Tickets are still available and may be ordered by contacting Father John at lmpm46@aol.com or 570-876-1241. Additional details and general information on the March may be found atwww.marchforlife.org. Metropolitan Tikhon will be enthroned as Primate of the Orthodox Church in America during the Divine Liturgy at Saint Nicholas Cathedral on Sunday, January 27. Additional information on the weekend’s services and other events, as well as lodging and banquet details, may be found on the OCA web site.